Mobile Infinity-GMIC 2016 was a power-packed two-day conference that brought together various domains, technologies and opportunities in the mobile industry. Mayflower was present at the conference to support and enable these mobile app start-ups in going Glocal through translation and localization services. This was the second time that Mayflower has exhibited at the GMIC Conference. The conference has proved to be a platform that brings together the latest in technology, the thought leaders and the support services, who ensure a brighter future for the mobile industry globally. 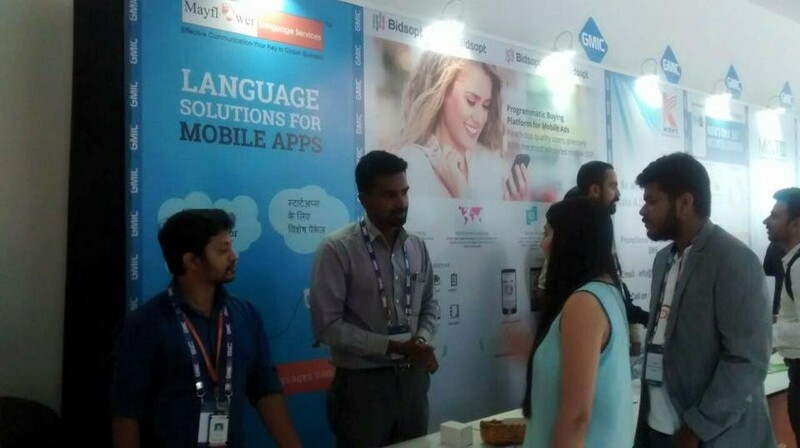 Mayflower exhibited with the objective to spread awareness about the benefits of translation and localization to both start-ups and established mobile app companies. Most of the established mobile app companies that visited our booth were looking for localization services to expand the reach of their app whereas the other start-ups were interesting in understanding how we can support them. The conference and expo also provided visibility to apps in the sustainability and NGO sectors. Mayflower was the only language service provider at the conference and most attendees were delighted to find a one-stop solution for all their language requirements. We were glad to have Mr. Wen Chu, founder GWC as our first visitor. The event also served as a platform for some well know names like Alibaba Group, Cheetah Mobile, Bai du, ShareIt, Meitu who were looking to collaborate with Indian firms so as to reach out to the Indian market – an addressable yet unexplored area. Representatives of the Chinese media were also present at the event and primarily focused on creating awareness and bridging the knowledge gap between Indian and China. The event, with focus on mobile apps, provided both app developers and other support systems with a sneak peek into the next phase of the mobile revolution. The “Thought Leaders” stage of the conference provided the audience with insight on India as a market and as a global leader in the mobile industry. The session by Sachin Bansal, Executive Chairman – Flipkart moderated by Vikram Chandra, Consulting Editor – NDTV, was extremely informative as it addressed current events like the recent demonetization steps taken by the Government of India and its effect on the Indian mobile market. Arun Nageshwar, AVP-Sales, Mayflower said, “It was great to see how the conference had begun with an India vs. China perspective and moved on to India and China as joint market.” Another interesting session by Umang Bedi – Managing Director, India, Facebook focused on how society has moved from an industrial to informative era and then to the current digital era and how digital disruption is just the beginning of a new revolution. There were also specific sessions and workshops by leaders from Facebook in the “Developer stage” that provided inputs to app developers on improving both revenue and the overall end-user experience. The two-day conference was both informative and filled with opportunities. GMIC 2016 was a platform where the dreamers, doers, innovators, game-changers, perfectionists, creators and enthusiasts came together to discuss the trends in this growing sector and shed light on how it is positively changing the world. The event was well organized with a perfect blend of sessions for all in the mobile industry. Mayflower looks forward to the next edition of this conference to help mobile innovations reach the global and local audience by overcoming language barriers.